Tired of the same old, same old in your blues CDs? Tired of hearing the same old tired guitar solos and the same old drums that threaten to pound you into submission on every CD you purchase? Longing for a CD that brings back the old barrelhouse, boogie woogie piano of the '40s and '50s that gets your toe to tapping and puts a big smile on your face? 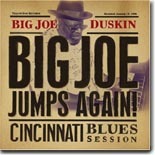 Well, look no further than Yellow Dog Records’ latest release, featuring Cincinnati native son, Big Joe Duskin. Duskin’s story is an interesting one. Enamored with the blues as a youth, he incurred the wrath of his father, a preacher, for playing the blues on occasion. Finally, the Reverend Duskin made his son promise not to play the blues until after his death. Because his father was approaching 80 at the time, the teenaged Duskin agreed to this concession, not knowing that his father would live to be 105! Until his father’s death, Duskin was content to play piano in church, and went to work as a policeman and later a postal worker in Cincinnati. By the time his father died, Duskin had pretty much forgotten everything about the piano other than what he played in church, but in the early '70s he was encouraged to give the blues another try. Duskin finally recorded a couple of records, including a well-received album for Arhoolie in 1977, but this is his first trip to the studio in 16 years. Big Joe Jumps Again! is an informal, relaxed session of blues and boogie recorded in Cincinnati (at Monfort Heights United Methodist Church, a setting which would probably would not have suited the elder Duskin) and lovingly produced by Larry Nager, who also plays bass on two tracks, and Yellow Dog recording artist William Lee Ellis, who contributes some dandy acoustic guitar on a couple of tunes (including the standout “Betty and Dupree“). Duskin’s two-fisted skills on the piano and his powerful, expressive vocals will remind you of Champion Jack Dupree, Memphis Slim, and Roosevelt Sykes. The 16 tracks include covers of songs by Sykes, Memphis Slim, Lowell Fulson (the rollicking “You‘re Gonna Miss Me,“ which is so good Duskin does it twice on the album), Memphis Minnie, Big Bill Broonzy, and Lucille Bogan. Duskin even recounts his conflicts with his father on a spoken-word narrative, “The Preacher And The Devil’s Music,” and pays tribute to his days in the church with a snippet of “Just A Closer Walk With Thee” to close the CD. A tip of the hat to Yellow Dog Records for getting this legendary piano man back in the studio again. For those of you who are in search of a smooth, understated blues album with some great piano from one of the few remaining members of the “Greatest Generation” of the Blues, this disc will surely fit the bill. The Blues Bytes Web Site has been developed by Blue Night Productions. For more info, send an e-mail. All contents Copyright © 2004, Blue Night Productions.